The very first Dead Moose, Inc. film, it stood on the shelf for 17 months until editing software arrived. After staying in the cabin, a man walks out and you know the rest. 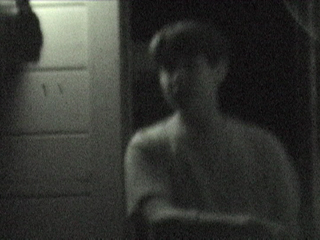 In early October 2002, my Kennedy Middle School buddy and I decided to make a movie for Halloween time, to show off to trick-or-treaters. My drawings were ambitious- I aimed for a conclusion that ultimately ended up with the zombie having a lawnmower and its victim being run over, spraying gallons of blood onto the murderous zombie. Yes, I was 13. There were no realistic expectations- just the inspiration as gathered from Bruce Campbell's autobiography, as well as tons of sick and gross ideas from cult horror movies I only had pretended to see. 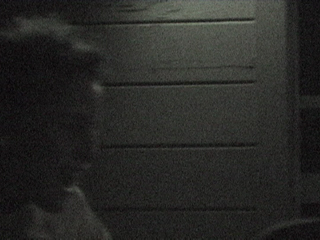 When it came down on that night of October 25, we shot the first scene of me walking into the cabin. It's an embarrasing scene, and as I wasn't nearly as careful with my footage as I am now, it got recorded over with the tail-end of a "South Park" episode. That was probably for the better. We went to the school dance, and then came back and did the rest at night. While fake blood and fake flesh were bought and applied to my arm, our cameraman was someone visiting the house, and just filmed the main zombie attack- never mind the bad lighting and blurry image, the make-up didn't even show up in the frame! That Halloween, we set up the TV and the camera to play it, but on the side there was to be a show: after the clip played, I was supposed to walk out to the trick-or-treaters and say "But what you don't know is... the zombie is still HERE!!!! "- and then Noxin would leap out and attack them. Unfortunately for us, the screening only happened once, and Noxin didn't hear my cue. "ZOMBI!!!" remained on the shelf, though it was much talked-about and many other projects were planned but never filmed; Dead Moose, Inc. certainly would have been a lot different if they did happen. After many months, I got the editing software and cables necessary to transfer it on the computer and post it online. And now it's derided as the worst thing we've ever released.